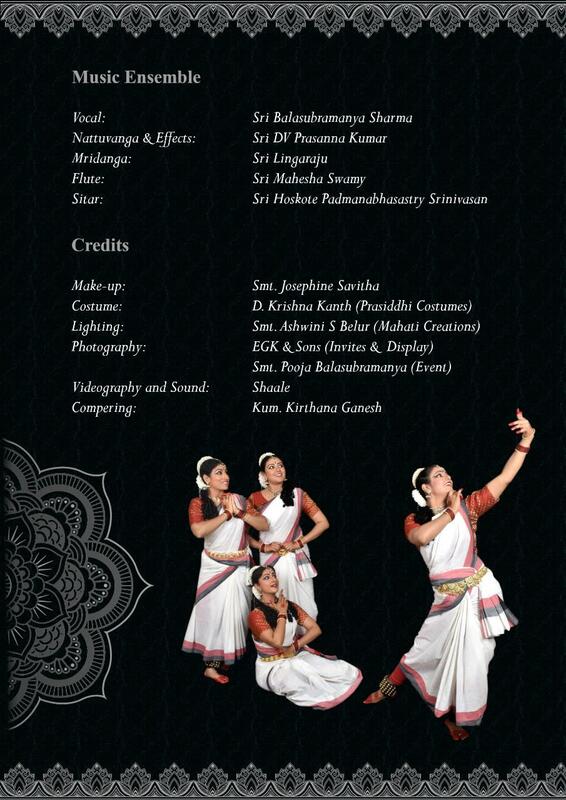 Sukhalaasa is an up-and-coming Bangalore based Bharatanritya Dance Ensemble. Formed in 2017, Sukhalaasa has to its credit a series of productions at prominent Art and Cultural festivals, comprising of a repertoire of items that showcase our rich artistic heritage. 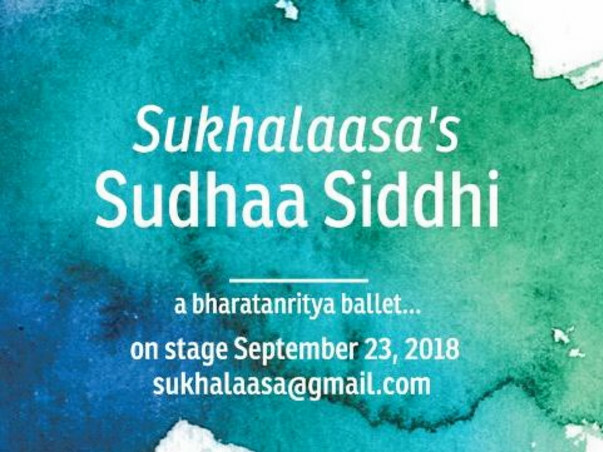 This September, Sukhalaasa brings to you Sudhaa Siddhi – a thematic Bharatanritya ballet. Bharatanritya is a pedagogy of dance we owe to the research works of PadmaBhushan Dr. Padma Subrahmanyam, who reconstructed the 108 karanas (or basic units of movement) given in the Natyasastra, which is the oldest known treatise on dramaturgy dating back to more than 2500 years. Sukhalaasa’s Sudhaa Siddhi tells the story of a popular Puranic epic and its symbolic and philosophical relevance to mankind today through the beautiful language of Bharatanritya. Literally translated to “the quest for Moksha”, Sudhaa Siddhi is an introspection of human life and its purpose in the form of a story. You can become an important part of this story by contributing funds towards the staging of this ballet. You are welcome to donate to our production fund in denominations of x100, x500, or x1000. Any amount, big or small, will play a major role in mobilizing the resources required for the project. Come join us in this journey... contribute to our endeavor in showcasing Indian Classical Arts in all its magnificence. 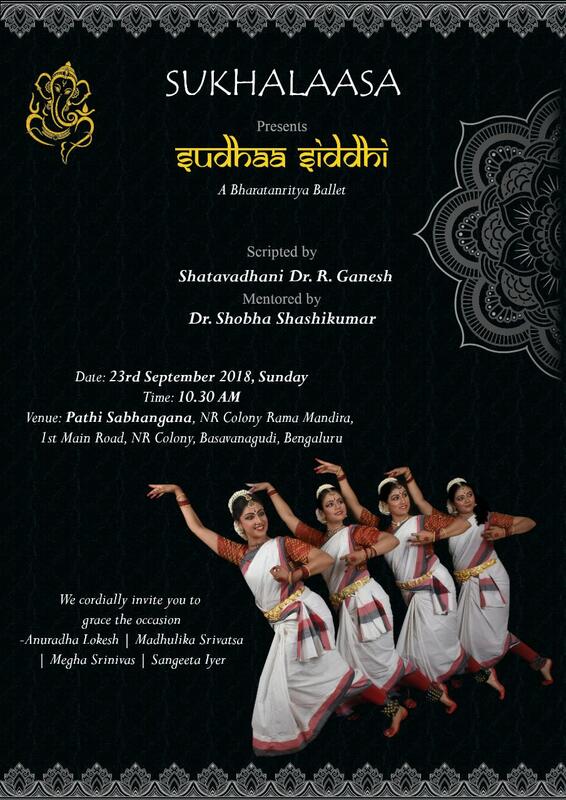 Sudhaa Siddhi will be staged on 23rd September, 10.30 AM, at Patti Sabhangana, NR Colony Rama Mandira, Bangalore. This is a non-ticketed event and is open to all. Thank you so much for your contribution to our event. It was indeed a great experience for ourselves and our audience yesterday. This couldn't have been possible without your support. You have our undying gratitude for your support! Thank you so much for your contribution. We are excited about the event and it's turning out well..
We will be very happy to see you around - request your gracious presence.